These pages attempt to set out what information I have on the dress and equipage of the Local Militia regiments of a few selected counties. They are very far from complete, and I apologise for that; when new information comes along it will be added. To save repetition, what follows here is an introduction, with some general comments that may be helpful. The appearance of the infantry volunteers of the 1790’s often tended towards one extreme of semi-civilian simplicity or to another of “fancy dress” (as one disapproving commandant put it). In 1803, when local volunteer corps were re-formed, this gave way to a more professional and homogenous approach; the new corps were restricted to the red of the regulars and militia (or green for rifles), and were strongly encouraged to follow the patterns of their county militias. Some did so, but others did not, and local pride still fostered local variations. In 1808, the new Local Militia system was formed, and existing volunteers were urged to embrace it. The majority did, lock, stock and battalion, to the extent that the Local Militia was never the conscript system that had been intended, but largely a reincarnation of existing volunteer corps. The clothing of the Local Militia is to be the same in every respect as that worn by the regular militia of the county. Sealed patterns are delivered by the storekeeper-general, which are to be used as part of the supply of the regiment. … these patterns are not intended to govern you in regard to the colour of the facings, figure of the lace or buttons; upon these points you are to conform precisely to the uniform of the Militia of your county. 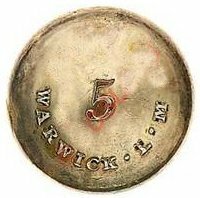 Although the shape and size of the Local Militia Buttons must be the same as those worn by the Regular Militia, the difference in the nature of the Service requires that there should be a corresponding difference in the title on the Button. … the clothing and necessaries belonging to each corps of Local Militia should be lodged in the regimental depot, at the termination of each period of assembling for training and exercise. Persons quitting the Local Militia, for the purpose of enlisting … will be permitted to take with them their necessaries … To their clothing, arms, and accoutrements, they will have no claim. As a result, no items of other ranks’ wear, at least as far as I know, still exist. Those of officers, being their own property, have survived in small numbers, and form a good portion of the available evidence for the appearance of these regiments. Despite the requirement to adhere “in every respect” to the clothing of the county militia (or to one regiment of it in counties where militia facings and laces varied between regiments), officers’ coats and jackets show some variations, though only in minor respects. Certain details – buttons, belt plates – remained regiment specific. As in the “regular” militia, a few light companies allowed their officers the distinction of cavalry styled jackets. Corporals, privates and drummers wore the lace of their “regular” county regiments. It is at present fixed, that the regiments are to be generally clothed once in four years, and the non-commissioned officers and drummers who are retained at head-quarters on constant pay, at the expiration of two years from the delivery of their first clothing. 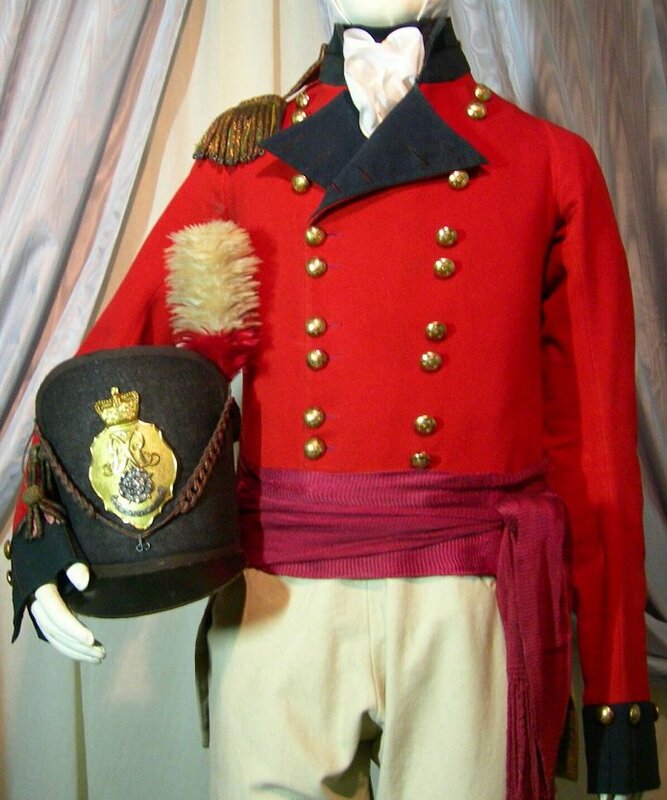 11 – 29 March 1813: in all regiments that have served four years, breeches and long gaiters to be withdrawn and returned to the Storekeeper General; grey trousers and short gaiters to be supplied by the commanding officer in accordance with sealed patterns or, at the commandant’s request, from the Public Military Store. 13 April 1813: to be at the option of commanding officers whether officers should adopt “the present dress of the regular army”, i.e. the new cap and jacket. 17 April 1813: if grey trousers cannot be supplied before training, commanding officers are to provide duck trousers instead. 28 Dec 1815: no more clothing to be provided for Local Militia, except for the permanent NCO’s and drummers at Headquarters. Though all Local Militia regiments were disbanded in 1816, their skeleton staffs were maintained until a reduction in 1829, the “reduced adjutants” being paid allowances for many years after and in some cases continuing to wear uniform. In many counties, some at least of the 1803 volunteers were issued accoutrements with black leather belts, though many corps managed to switch to white belts before transferring to the new Local Militia. This disparity was to be addressed by the orders published as Rules which his Majesty has directed to be observed in the Equipment of Regiments of Local Militia. 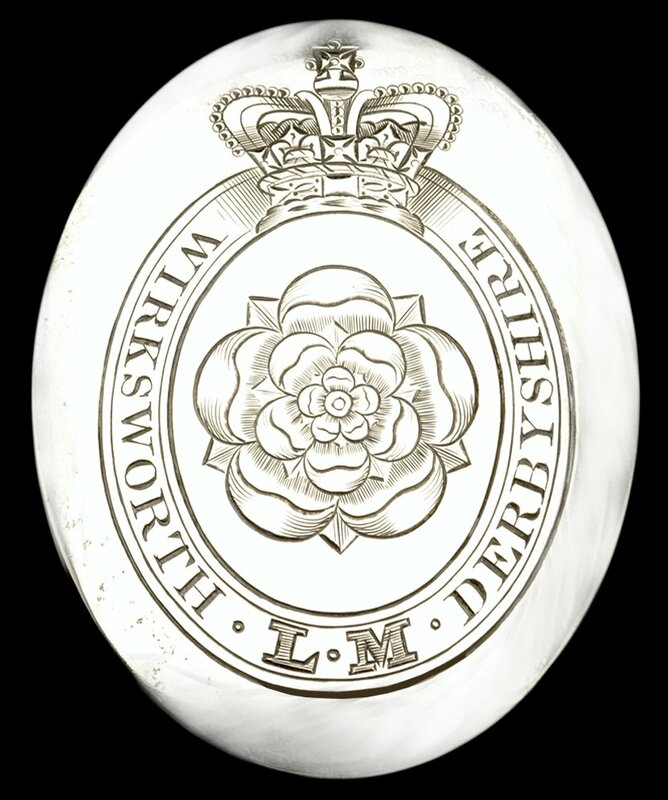 The rules appear a little confusing, but the essentials were that regiments with all white accoutrements in serviceable or repairable condition were to continue to be equipped with white, as were those with mixed black and white, but having a majority of white. Those with all black accoutrements, or, if mixed, a majority of black, were to be equipped with black. The latter must, in the event, have been very much in the minority.